Mother Nature continues to stifle action in the East, affecting some of our focused events for wagering. Last Thursday’s Super Bowl series did not launch at the Meadowlands due to inclement weather causing the program’s cancellation (we will cover it in our Thursday blog). Also, on Friday, Monticello closed due to severe winter conditions in upstate New York, nixing one of our overnight choices. We will keep that horse on the watch list and include new overnight features on Thursday. We continue to offer prime plays from overnight races as the season ensues. Remember to keep your TwinSpires account healthy and try not to miss some great wagers in the overnights we feature. Our exclusive horses-to-watch (H2W) list again produced some strong plays and across-the-board returns. Results from Monticello on last week’s list will be included in our next H2W results grid, as all of the horse are set to race on the day after our deadline here. The H2W results list across-the-board prices. Also, exactas are included when a H2W horse finishing first or second completes the result with a race favorite or another H2W horse listed as the winner in the same race (*asterisks note the particular races along with track name). 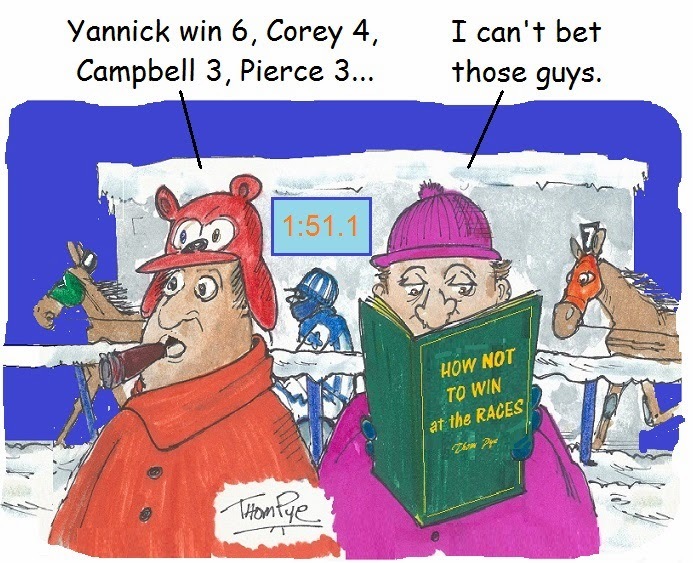 This holds true, also, for trifectas if three H2W horses finish win, place and show. The Canadian Sportsman, a century-old publication which was dedicated to features on harness racing throughout the Great White North, published its final issue in December of 2013. The depressed standardbred atmosphere, especially in the Ontario breeding area, was sited as the main reason for the magazine’s demise. Standardbred breeders’ advertisements supported the slick pages of the bi-weekly until their coffers weakened. This is just another “little death” in the history of harness racing in the east of the country, where casino gaming appropriations were cut dramatically, affecting the many Ontario raceways sprinkled across the vast province. Meanwhile, Friday, Jan. 3, Ontario’s Western Fair remained open while some other tracks closed due to weather. The program produced a handle of $536,725 – the highest single night total in more than a decade. It was a big start to the 2014 season for the oval and marks the fourth time in the last five programs it topped the $400,000 mark in handle. Western Fair has become one of this blog’s H2W tracks. The Meadows is another track in the east rearranging its schedule due to predicted frigid temperatures. The Meadows has cancelled its card for Tuesday, Jan. 7. Live racing will be added on Thursday, Jan. 9, originally a dark day. The modified schedule for next week is as follows: Monday, July 6 — Live racing, first post 12:55 p.m.; Tuesday, July 7 — Live racing canceled; Wednesday, July 8 — Live racing, first post 12:55 p.m. The card will be the program originally drawn for Tuesday. Also: Thursday, July 9 — Live racing, first post 12:55 p.m.; Monday; and Friday, July 10 — Live racing, first post 12:55 p.m.
On a bitter-cold day at Freehold’s fresh meet, 80-year-old James Porter drove the winner of the third race with a horse owned by 80-year-old Eugene Landy. It was the first win for five-year-old Buenos Aires Lady, who paid $17 to win. Porter, who turned 80 on Nov. 12, reportedly drove the mare himself because he never had problems with her breaking stride during training sessions. In their first start together, they finished second. Jan. 2’s victory was their second race together. Western New York’s rugged Buffalo Raceway opens amid the iced atmosphere Wednesday, Jan. 8 for a 99-day racing season. Buffalo has reaped the benefits of early-season racing in recent years. COO Jim Mango said the track needs to take advantage of an early season opening, despite the weather due to “success the past few seasons racing in January, February and March. We are one of the few tracks still willing to race then; it gives us great exposure and brings in some good drivers and horses.” Buffalo will race on Wednesday, Friday and Saturday nights in January. Post time is 5 p.m. on Wednesdays and 6:40 p.m. on Friday and Saturday evenings. In February and March, Thursdays will be added with 5 p.m. start time.